IRVINE, CA--(Marketwire - March 8, 2011) - RIDEMAKERZ announced today its Downtown Disney shop at Lake Buena Vista, Fla. won worldwide "Pop-Up Store of the Year." This is the second year in a row that RIDEMAKERZ has claimed the award presented by Chain Store Age magazine. The award recognizes RIDEMAKERZ for its creativity in transforming a 16,000 plus square foot retail venue into an auto-garage where kids and kids at heart can customize their own 1:18 scale toy vehicles, or RIDEZ. "It's an incredible acknowledgement for RIDEMAKERZ to win Pop-Up Store of the Year two years in a row, especially given the momentum and creativity in this rapidly expanding category," said Larry Andreini, ZEO (CEO), RIDEMAKERZ. "Disney offered us an incredible space, and we were able to deliver a one-of-a-kind RIDEMAKERZ experience for the ages." Much like its fully-customizable RIDEZ, the RIDEMAKERZ pop-up at Downtown Disney - Lake Buena Vista was completely tricked out. The shop immersed customizers in a real world auto salon with show-quality cars, including rides from the personal collection of legendary car customizer Chip Foose. Additionally, a specially designed radio-control track lets customizers play with their creations on-site. The RIDEMAKERZ pop-up at Downtown Disney - Lake Buena Vista will remain open through April 30, 2011. Since its inception in 2006, RIDEMAKERZ has been committed to the importance of play in the positive development of kids. Driven by real-world car culture and a passion for having fun, RIDEMAKERZ inspires self-expression through the creation of one-of-a-kind toy cars or RIDEZ. The brand's intense focus on detail, quality and the joy of creating something unique has won praise from kids, parents, educators, industry leaders and car enthusiasts alike. To learn more, visit RIDEMAKERZ.com. RIDEMAKERZ won worldwide 'Pop-Up Store of the Year' by Chain Store Age. 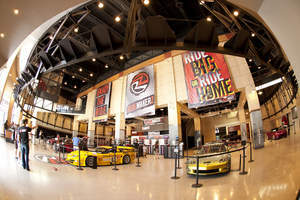 The award recognizes RIDEMAKERZ for transforming a 16,000 plus square foot retail venue at Downtown Disney - Lake Buena Vista, Fla. into an auto-garage where kids and kids at heart can customize their own 1:18 scale toy vehicles, or RIDEZ.